June 14,2015—The human population has been growing since the origin of the species homo, more than three million years ago. Modern humans developed about 200,000 years ago. 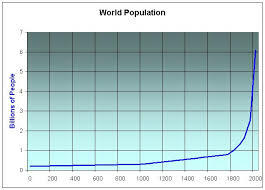 The size of the population has increased during this long time span. Although it has not grown at a steady rate, the number of inhabitants of our planet has been rising. In the last century, it has increased at a faster rate than anytime during this span. Categories: Climate Change, Population, Poverty | Tags: Climate change, Population growth | Permalink.